Depending on the theme you are looking for or the area, you can have different tour. Check out www.withlocals.com, a web platform that show you the different torus available in the city you are in and put you in relation with a local guide to show you around. It is a good way to discover the city through the eyes of a local. Plus, it is free for kids and different languages are available. For a personalized experience just contact the guide and see what can be done. Now, you just have to go on the website and select your family tour! First time in Barcelona? You want to see the must of it? Let the guide walk you through Barcelona and its history. This tour lasts three hours and will let you discover the main attractions of the city. Meet the guide at Drassanes, only 20 minutes from Aparthotel Mariano Cubi by subway and let’s start the tour! You will discover the mythic La Rambla, check out the Palau Guell, a Gaudi’s masterpiece and see the Plaça Reial, a place stuck in time. A little churros break in the oldest Xurreria (churros shop) of the city and here we go again. Visit the Casa de la Ciutat and the Palau de la Generalitat, two government building to understand a bit more Catalonia and its functionment. Then, walk through the old part of the city, with its Roman walls, to Barceloneta, an area shape by the Olympic Games of 1992 and end up in the Ciutadella Park. On the way, you will see some local secret places and mostly, learn a lot on the history of Barcelona thanks to your guide. This tour can be in Spanish, English, French, Portuguese, Dutch, Italian and Romanian. It is time for a workshop! What better souvenir than the one you did yourself? Meet your guide, a mosaic artist at Park Güell (30 min away from our aparthotel for family) and go to the picnic area (free area of the park). She will tell you all about Gaudi’s heritage and the Trencadis (the mosaic you are going to do). 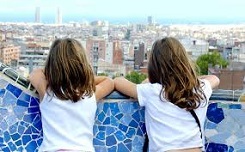 A good way to learn more about Barcelona’s culture while letting your imagination worked. This tour is in English or Spanish. For the foodies, here is the perfect tour for you! Just walk 5 minutes out of our familial aparthotel and meet the local guide. 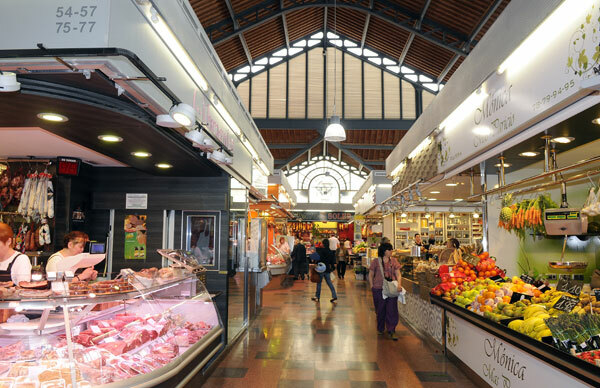 There, dress up like a chef (the chef’s hat make the deal) and let’s discover the Mercat de la Llibertat with your little chef(s). Learn the local habits, recipes and do a treasure hunt! Of course, some tasting of local products are planned, with jamon, minifuet (sausages), cheese, churros, pastries… Enjoy this unique foodie experience in Gracia! This tour is in English, French, Dutch, Spanish and Italian. With these different tours, you have different opportunities to discover Barcelona through the eyes of a local. If you want more advices, come to the front desk of our family aparthotel in Gracia, will be happy to help you!